BRASILIA, Brazil, April 20, 2010 (ENS) – Today’s bidding for electricity generated by Brazil’s planned Belo Monte Dam in the Amazon rainforest has been marked by protests and legal confusion. A court injunction issued late Monday suspended the dam auction overnight, throwing the bidding process into a state of chaos. Just moments before the auction was set to begin, a second injunction overturned Monday’s suspension, reinstating the auction by the Brazilian Electricity Regulatory Agency, ANEEL. The auction is being conducted electronically from the agency’s headquarters in the capital, Brasilia. When the bidding was concluded, the tender was awarded to Norte Energia, a consortium led by the utility Cia. Hidro Eletrica do Sao Francisco, CHESF, a subsidiary of the state electricity company, Electrobras. The consortium also includes eight private companies. The generating capacity of the R$19 billion Belo Monte dam would be the world’s third greatest behind China’s Three Gorges dam and the Itaipu dam on the Brazil-Paraguay border. ANEEL says energy is expected to start flowing from the Belo Monte dam in 2015. In Brasilia, Greenpeace and indigenous peoples today blockaded the main entrance of the ANEEL office building to protest the dam. The most recent round of legal battles over the Belo Monte Dam on the Xingu River took a new twist on Friday, April 16, when a regional appellate court overturned an April 14 decision by Federal Judge Antonio Carlos de Almeida Campelo to suspend the preliminary license for the dam and cancel the auction. Judge de Almeida’s decision is based on the lack of a specific law allowing the use of hydraulic potential on Indian lands as required by the Brazilian Constitution. “It remains proven unequivocally that the Belo Monte hydroelectric will exploit the hydro energetic potential in areas occupied by indigenous people who will be directly affected by the construction and development of the project,” Judge de Almeida wrote in his decision. Today, as the auction proceeded in Brasilia, indigenous, environmental and social groups organized protests in more than nine cities in eight Brazilian states. Thousands of people including indigenous people, the Brazilian Movement of Dam-Affected People, the Landless Workers Movement, and environmentalists are engaged in simultaneous protest actions in the state capitals of Fortaleza, Florianopolis, Porto Alegre, Porto Velho, Belo Horizonte, Belem, Campina Grande, and the city of Altamira. Boatloads of indigenous people are arriving on the proposed dam site located on Pimental Island on the Xingu River’s Big Bend to establish a permanent village to block dam construction. In Belem, 700 local people occupied the offices of Electronorte. And near the town of Altamira, the Landless Workers Movement and the Movement of Dam-Affected People blockaded the TransAmazon Highway. “The Lula government is clearly pressuring the courts to approve Belo Monte against the rights and interests of indigenous people and the local populations of the Xingu, and it’s our lives at stake,” said Sheyla Yakarepi Juruna of the Juruna people, who met with judges on Monday urging the President of the Appellate Court for Region 1, Jirair Meguerian, to uphold the injunction. “Even so, the people affected by this dam are united and determined to stop the project, we will not give up this fight,” Juruna said. 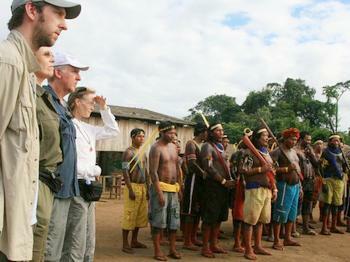 The Belo Monte controversy attracted worldwide attention earlier this month when “Avatar” director James Cameron and actors Sigourney Weaver and Joel David Moore visited the Volta Grande area of the Xingu River and joined protests by indigenous and locally affected populations in Brasilia against the dam project. “They deeply fear the impact this dam will have on their lives, and are certain that it will end their way of life. They are prepared to do whatever they can to fight the dam, including lay down their lives if necessary. It was a highly emotional meeting, and I felt compelled, from that moment on, to do what I could to prevent the dam from being built,” Cameron wrote. The Belo Monte dam will inundate over 500 square kilometers of land, and divert nearly the entire flow of the Xingu River through two artificial canals to the dam’s powerhouse. This river diversion will leave indigenous and traditional communities along a 100 kilometer (60 mile) stretch of the Volta Grande without water, fish, or a means of river transport. Conservationists and indigenous communities fear that if the dam is built, the rainforests in this region would be completely destroyed. 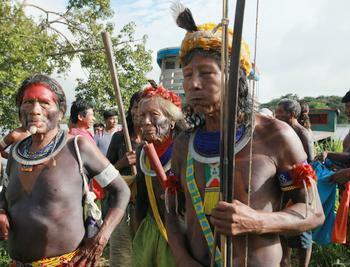 “The violation of indigenous rights is a matter of national and international concern. Brazil doesn’t need the Belo Monte Dam. By investing in energy efficiency Brazil could avoid the need for as many as 14 Belo Monte dams and save billions of dollars in the process. Belo Monte Dam just doesn’t make sense,” said Aviva Imhof, campaigns director of International Rivers, a nonprofit organization based in California. Two consortia vied for the rights to build the project: Norte Energia, which includes the state-owned CHESF and eight private companies; and Belo Monte Energia, which includes the state-owned Eletrosul, in addition to five private companies, including mining giant Vale. To build Belo Monte, the winning consortium would dig two canals that would involve moving more earth than was dug for the Panama Canal to divert water from the river to an artificial reservoir. Atossa Soltani of Amazon Watch, who accompanied Cameron and the Avatar actors in Brazil, says if the river diversion takes place, the Big Bend or Volta Grande, home to the Paquicamba indigenous territory of the Juruna people and the Arara people, would be dried out, gravely affecting the livelihoods of indigenous and riverine families who depend on the water for subsistence. In total, some 45,000 people are directly affected by the either flooding or diversion of the river. 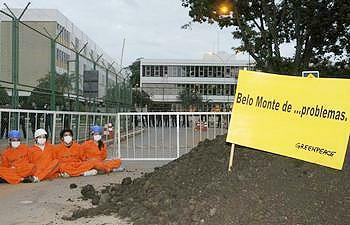 International groups, such as Amazon Watch and International Rivers, support their counterparts in Brazilian civil society in pressuring the Brazilian government to suspend Belo Monte, as organizations and individuals around the world called local Brazilian embassies to protest the government’s plan to build the project despite widespread violations of indigenous rights. Financially, the conservationists say the Belo Monte Dam is a risky project, which will generate only 10 to 30 percent of its 11,233 megawatts installed capacity during the dry season, and an annual average of 4,462 MW. To make the project viable in a context of financial uncertainties and pressure from private investors to lower the auction’s price ceiling, the government has had to draw from public pension funds and issue US$4 billion of credit from the public Brazilian National Development Bank.